Volunteer Shoutout: Meet the U of M CAA Chapter Co-Presidents! Meet Jessica and Maya, co-presidents of the University of Minnesota CAA Student Group. 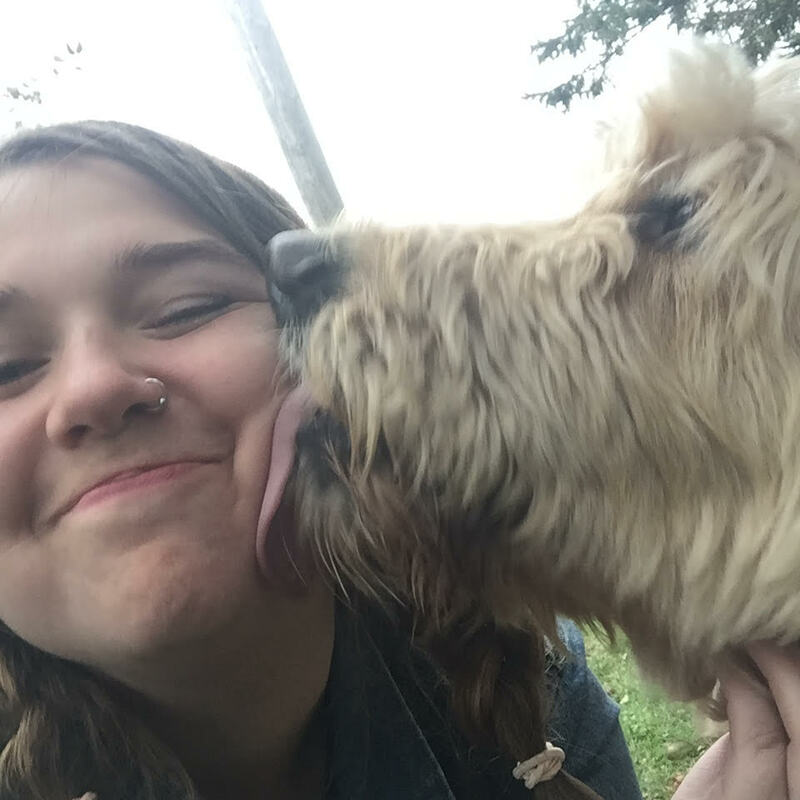 Between studying for classes, leading CAA student group meetings and events, and more, these two are working toward making their dreams for themselves and the animals happen! Get to know a little bit more about both of them below. 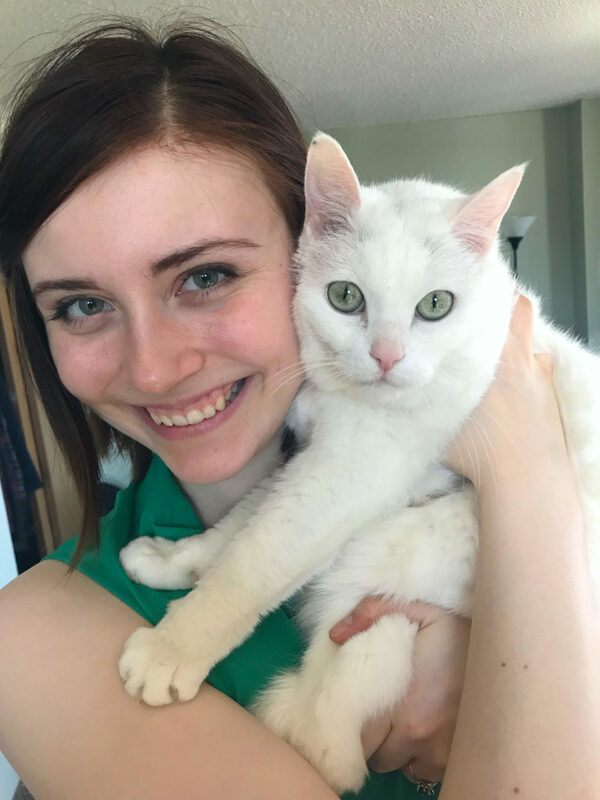 Jessica with Izzy, a 15-year-old sweetheart she rescued December 2018. What are you studying at the U? I am majoring in Gender, Women, and Sexuality Studies. What drew you personally to veganism? I was a vegetarian for many years, and I was drawn to veganism when I learned that cows, like all mammals, only produce milk in response to pregnancy. (I grew up thinking that cows just made milk—because that’s what cows were “for.”) As a very passionate feminist, I was motivated to go from vegetarian to vegan because of my strong belief in body autonomy—I don’t believe that animals bodies exist to produce dairy and egg products, and I believe that it is a gross violation of animals’ rights to have their bodies used and exploited for profit. How did you get involved with CAA? I first learned about CAA when I saw the painting on the Washington Ave bridge! I attended my first meeting as a freshman and loved the sense of community that the student group provided. What are three tips you would share with a friend transitioning to a plant-based diet? Start slow—in my experience, a slower transition is more sustainable long term than an overnight switch (although all ways of transitioning to veganism are valid and commendable)! I recommend giving yourself some time to explore vegan options and find out what you like so that you’re prepared to make the transition in a healthy and manageable way. Don’t be afraid to try new things! While vegan substitutes are great (vegan burgers, anyone??) I encourage people to step out of their comfort zones and discover the huge and delicious world of vegan cuisine! A few of my favorite vegan cooking channels on YouTube are The Happy Pear, Sweet Potato Soul, and Caitlin Shoemaker/frommybowl. Know why you’re doing it. For me, my dedication to reducing animal suffering has kept me strong and devoted to my vegan lifestyle. Do you have a favorite CAA event? I love the bake sales! We have such a good time getting together to bake vegan goodies (and of course taste testing to inspect quality). Maya and I love being creative with icing and decorating cookies and cupcakes. What are your plans for the next year? Next year will be my senior year since I’m graduating a year early. I’m hoping to have a career in the nonprofit field after graduation, specifically within advocacy and anti-oppression based work. As for the student group, I hope that we continue to grow, recruit new members, and spread the vegan love on campus! What are you studying at the U?I am majoring in psychology and art and minoring in sociology and social justice. What drew you personally to veganism? I was drawn to veganism because of its environmental sustainability. I knew I wanted to do as much as I could to reduce my carbon footprint, and I love animals! How did you get involved with CAA? I had a friend who was in CAA and invited me to join. My first actual event was the May Day parade that we marched in. Don’t quit if you cheat or accidentally eat something that isn’t within the parameters of your plant-based diet. If you’re ever struggling with maintaining your plant-based diet, make a list of why you chose to do it in the first place. Find your community! It makes it so much easier to maintain if you have friends who are plant-based too. Do you have a favorite CAA event? My favorite event by far was the Vegan Chili Cookoff. It was so much fun and the turn out was really great. I also love the weekly meetings. What are your plans for the next year? I’m just going to continue to stay active on campus, and I hope to continue to grow our student group through both activities and people. Are you a University of Minnesota or Augsburg student? We have CAA chapters at both schools and you’re welcome to join! Visit our student group page to learn more about meeting times or our volunteer page to get involved.